This article is about the birds. For the two ships, see USS Warbler. For the singing group from the TV show "Glee", see Glee: The Music Presents the Warblers. These are somewhat more closely related to each other than to other warblers. They belong to a superfamily also containing Old World babblers, bulbuls, etc. 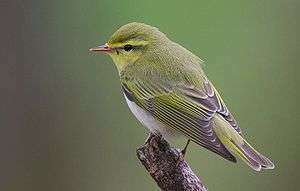 The two families of American warblers are part of another superfamily, which unites them with sparrows, buntings, finches, etc. These are the most distinct group of warblers. They are not closely related at all to the others, but rather to the honeyeaters and fairy-wrens. ↑ Wilson, Eisner, Briggs, Dickerson, Metzenberg, O'Brien, Susman, & Boggs. Life on Earth, Chapter: Biogeography, Graphic: Hawaiian Honeycreepers, p. 857.